Japanese Episode AG 124: "Kessen! Gurando Fesutibaru (3)!!" American Episode 394: "Rhapsody in Drew"
Haruka and Harley face off at the Grand Festival! 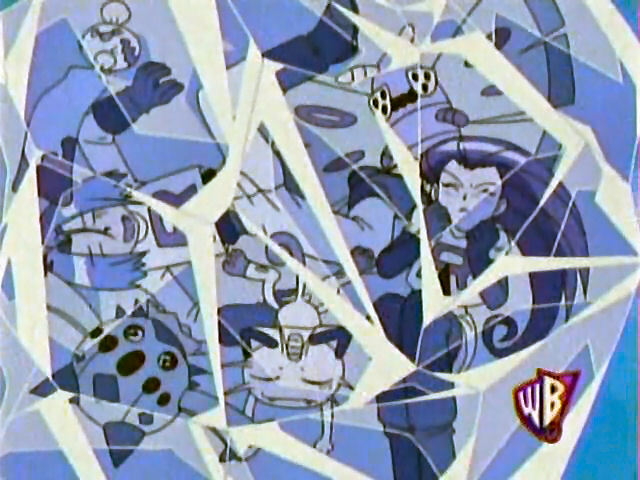 Harley's Noctus and Jupetta put up a good fight against Haruka's Agehanto and Fushigidane, but they are eventually defeated when Haruka's team works together. Meanwhile, Musashi plans to steal the identity of another Coordinator, this time selecting Robert as her target! Satoshi appears and calls on his Yukiwarashi to stop them, but it still doesn't have control over its Ice Beam attack! Robert steps in and tells the pokemon how to master it, giving Yukiwarashi the advice it needed to successfully execute the attack! As soon as the pokemon does, it evolves into an Onigoalie! 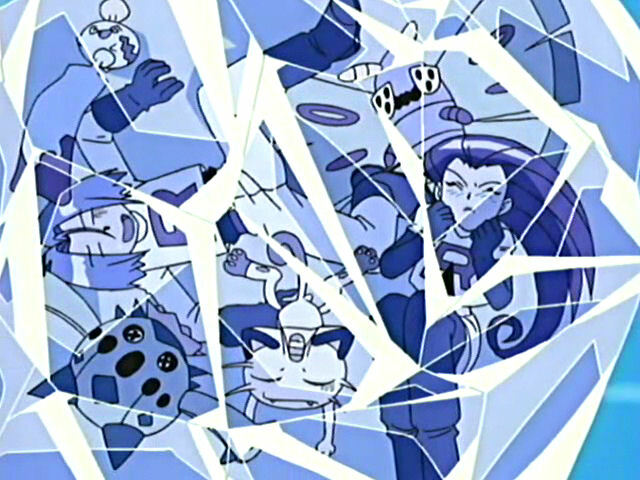 The ice pokemon is easily able to defeat the Rocket-Dan and sends them blasting off again. The competition continues, and Haruka finds herself pitted against her longtime rival, Shuu! 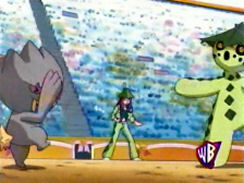 Despite Haruka's Wakashamo and Eneko bravely fighting against Shuu's Amemoth and Flygon, Haruka ends up losing the match. The young Coordinator simply smiles and thanks her pokemon for all of their hard work, happy that she even got the chance to compete in the first place. 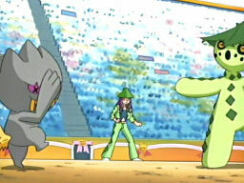 The Grand Festival concludes with a battle between Shuu and Robert which sees Shuu losing the match. After the award ceremony, a huge party is held to celebrate all the Coordinators' hard work. Haruka notices that Shuu isn't there and instead finds him training his pokemon on a nearby beach. He tells Haruka that he will meet her at the next Grand Festival and departs just as Satoshi and the others catch up with her. Haruka thanks everyone for cheering her on and decides to continue training until she can become a Top Coordinator. Our heroes' next stop is the Saiyuu City, where Satoshi will compete in the Houen League! Here we are, the Grand Festival finale. We all knew Haruka would lose the thing, but at least she was able to put up a good enough fight that we weren't bored watching her lose. 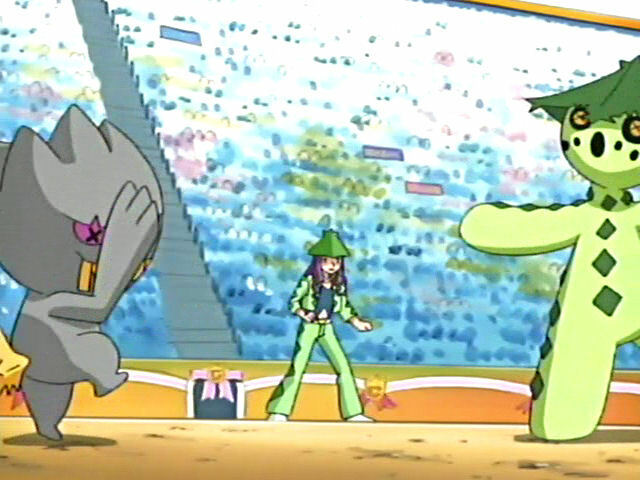 I think her Wakashamo really shined in this one, and seeing Shuu handle a Flygon so well was also fun to watch. 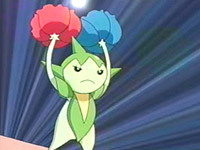 The biggest surprise, though, would have to be Yukiwarashi's evolution into Onigoalie. It was totally unexpected, one because it was just caught and two because we didn't have any Next Episode Previews to tip us off. I think the evolution was a good thing, and it'll be great to see such a funky looking pokemon act the way Yukiwarashi did. In Japan, this episode aired as part of a two-hour special that also included parts one and two of the Grand Festival in addition to a 30-minute special about Myuu and the Wave-Guiding Hero, Lucario and the Pokemon theme park in Nagoya. As for the English version...apparently the letter x is taboo now. *Sigh*...when will the stupidity end? The first two seconds of the episode are cut out. Then, two seconds are trimmed from the episode's title screen. The x's on the eyes of Harley's pokemon are changed to > and <. I don't even know anymore. Pretty soon pokemon won't even be allowed to attack each other without it being censored. Ready Go! is used for the umpteenth time, this time from the point when Yukiwarashi evolves into Onigoalie until the Rocket-Dan is blasted off. We don't hear this song in the dub. Thank God. This time, Sabonea's eyes are non x-ed out. Two vocal songs in one episode!? Well, it is the Grand Festival, after all. 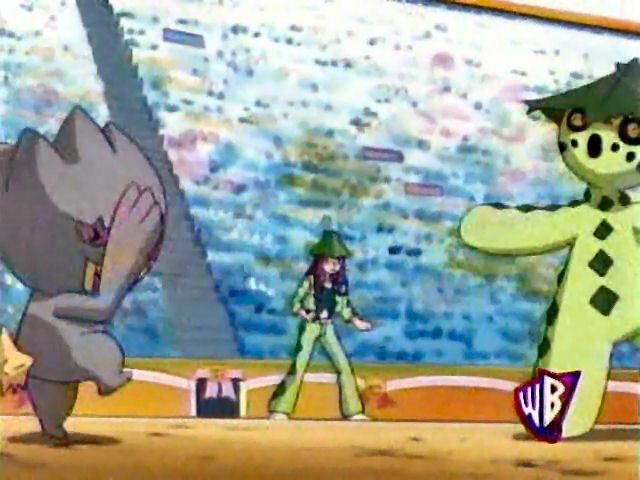 When Haruka's Wakashamo is ordered to go straight through Flygon's Flamethrower attack, OK!, the third opening theme to the first Pocket Monsters series, is heard in the Japanese version. It's a really fun and upbeat song, and it's not used often enough, in my opinion. It's nice to hear it here. Anyway, it's replaced by various instrumental cues in the dub. Two seconds are trimmed from the shot after the last Kids' WB! break. Three seconds are trimmed from the TO BE CONTINUED... screen.